This year at St. Jerome, we have adopted an integrated curriculum. Why? Because we believe that all truth comes from our Creator, so all truth is naturally interrelated. Literature relates to science. History relates to math. Art relates to religion. Because the world is integrated, students with an integrated curriculum learn how to think well and see the natural connections between ideas. Here at St. Jerome we knit together the web of knowledge in countless ways. The most obvious example of our integrated approach is our new humanities core class, which is an integration of history, literature, and religion. But the humanities core is just the beginning of our integration. In fact, it is hard to walk down the hallway at St. Jerome without seeing a web of connections made between subjects. Here is the perfect showcase for our integrated curriculum which was too obvious to walk by without noticing—and, frankly, too much fun to pass up! This is how Ms. Broz’s seventh grade class decorated their classroom door before Christmas break (below). Wait…is that…a…green man…holding his own head? And speaking? Indeed, it is! Perhaps it would make more sense if you knew that Ms. Broz’s seventh graders read Sir Gawain and the Green Knight, which is a medieval story that tells of Gawain’s enchanted adventure after he beheads a Green Knight in Arthur’s court. -Literature: The story of Sir Gawain is one of the greatest of the Middle Ages. The class also studied the poetic construction of the poem including the alliteration and the “bob and wheel” lines. -History: The story takes place in the Middle Ages, so as a part of the unit students learned about knights and chivalry, the Arthurian legends, and even the history of English. -Art: That’s a great looking Green Man! 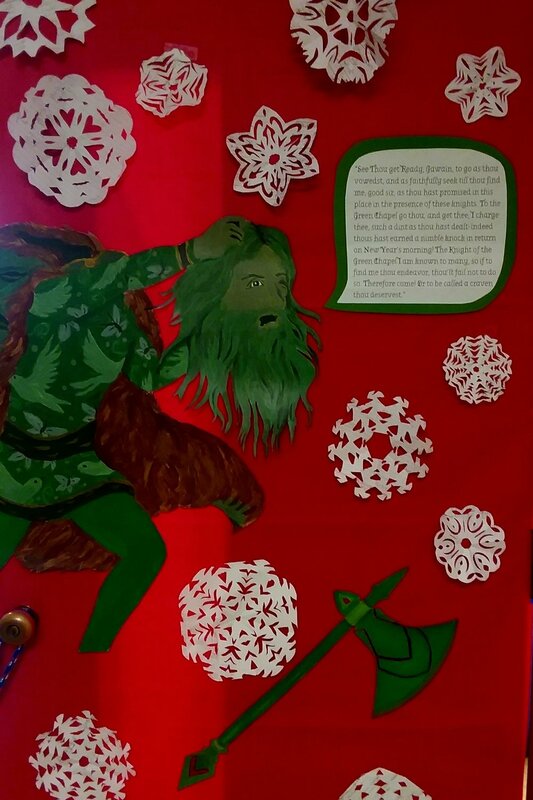 -Religion: Mrs. Broz’s class is pretty quick and knew that this was the perfect Christmas decoration since most of the story takes place around Christmastide, including this beheading of the Green Knight. In fact, the whole story reveals the medieval tie to the liturgical calendar. -Math: The class even related this project to their math curriculum. See the snowflakes? They are great examples of symmetry (maybe also a reference to the literary symmetry which frames the story), and the snowflakes are even cut out of old math notes! But that’s not all…the tale teaches about the importance of virtue. Do you see what the Green Knight is saying? He is issuing a challenge to Gawain. Gawain must fulfill his quest and prove himself a worthy knight by abiding by the virtues of knighthood. Literature, history, math, art, religion, poetry and virtue are all taught at St. Jerome, and here they all come together in one image. Now that’s integration! And this is just one window—or, rather, door—into our integrated approach. Think of the many connections our students are able to make every day as part of the excellent education at St. Jerome. Stay tuned for next week’s post on the importance of good literature. Sir Gawain and the Green Knight, trans. J.R.R. Tolkien (New York: Ballentine Books, 1975), 20. Perrin, Christopher, An Introduction to Classical Education: A Guide for Parents (Camp Hill, PA: Classical Academic Press, 2004), 26.